Meet the Futuro icons, with fantastic consistency of lines and colours inspired by the latest trends in design, both flat and line style combination. 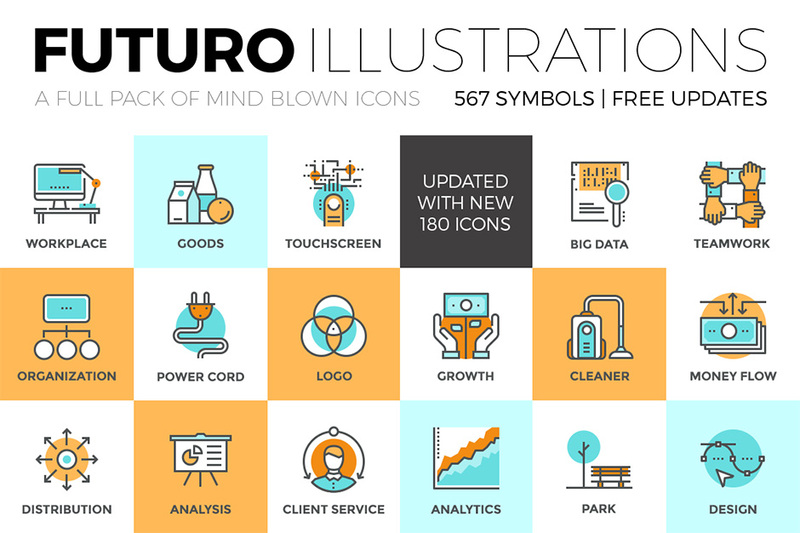 All of the 567 symbols in this collection are created in uniform design, based on a 64px pixel perfect grid and ready to use for a variety of projects. Software compatibility: Adobe Illustrator or Photoshop CS1 and newer. Also includes .PNG versions which work with any major graphic software. File size is approx 8.9MB (26.6MB unzipped), offered as a single download. Have been using these for years in my PowerPoint decks, really useful, versatile and stylish.